Mild Paths - ZineWiki - the history and culture of zines, independent media and the small press. Mild Paths is a fanzine by Albert Naasner, published by TFGC Publishing in 2014. Mild Paths is strongly inspired by Mild Palms, published by Nichtnachdenken.de. 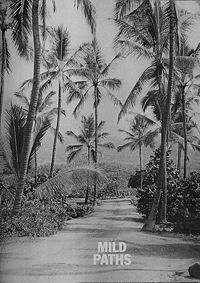 During St. Patrick's Zine Library 2014, Albert Naasner came across Mild Palms and his instant reaction was Mild Paths, which was printed over night and published two days after his first encounter with Mild Palms. Mild Paths is a fanzine-fanzine. Specs: b/w laser, 20x28cm, editon of 50. Included in the collection of the St. Patrick's Zine Library. Related articles: Mild Palms. More zines by Naasner 83/84, 76/84 and Unsere Erde. This page was last modified on 15 September 2014, at 12:33.